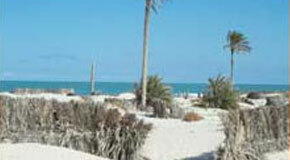 Djerba is a south-easterly island of Tunisia, in the gulf of Gabès. It measures about 30 km of width for 25 km of length, either a surface of 510 km2. The land of the island is flat and arid but the soil is arable, the Artesian wells constitute the main source of water. The olive trees, the palms - date palm and the fig-trees are the main cultivations. Besides agriculture, the fishing of sponges and oysters, the manufacture of potteries, jewelleries and cloths as well as the production of olive oil are part of the main activities of the island. 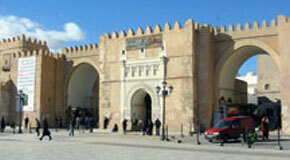 The city of Houmt-Souk, situated on the north coast, is the administrative and the business centre. In the Greek mythology, the island was homeland of the eaters of lotus. It was a Roman possession, then it was taken successively by the Arabs (in 655), the Normen of Sicily, the Spaniards and the Turks.